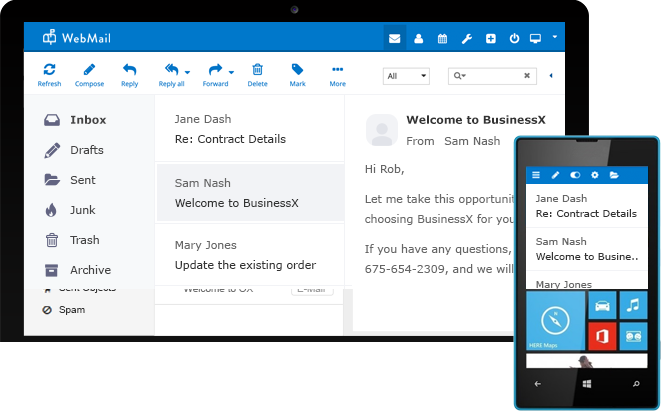 Enterprise Email Advanced and Corporate-class email. SiteLock Over 5000 websites get attacked everday. Get SiteLock and secure your website from hackers, viruses and malware. As opposed to free email solutions, you can give your business a more professional image with Business Email by getting email that is branded with your company's domain name (ex. sales@mybrand.ooo). In addition, you also benefit from our advanced email technology that gives you the least latency and industry-best uptime, scalability and reliability. An email service being served out of the cloud also means no IT, hardware, software, bandwidth or people costs. And the best part is that you can add email accounts as and when your team grows. To access your Webmail Interface, you can use the white-labelled URL: http://webmail.yourdomainname.ooo. Once on the log in page, you would need to login with your email address and the corresponding password.